The new edition of the Data Journalism Handbook explores new and innovative ways in which data is analysed, created and used in the context of journalism. And beyond that: it also reflects on the social, cultural, political and economic circumstances in which data journalism is embedded. 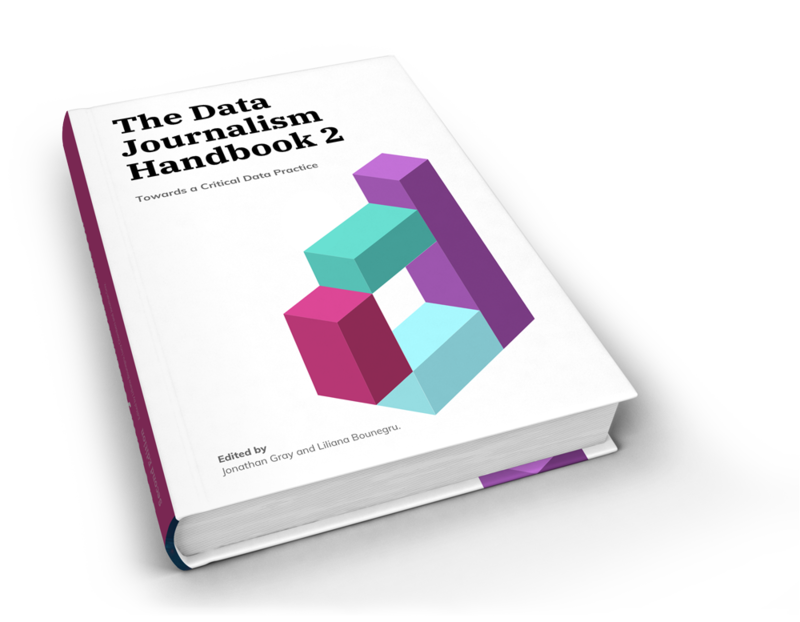 A huge amount has happened in the field since the first edition of the Data Journalism Handbook, published in 2012. The Data Journalism Handbook 2 wants to offer a unique perspective—a mix of views within and around data journalism. Alongside contributions from data journalists and practitioners about what they do, the book also includes the perspectives of researchers from fields such as anthropology, feminist studies, (new) media studies and digital sociology. The Data Journalism Handbook 2 is produced by the European Journalism Centre and Google News Initiative. The book will be available in English, Spanish, French and German as a free open-source download online and published by Amsterdam University Press (forthcoming, 2019). The Data Journalism Handbook 2 is edited, like the original, by experts in the field Jonathan Gray and Liliana Bounegru at the Public Data Lab. The original Data Journalism Handbook is a free, open source reference book for anyone interested in the emerging field of data journalism. The book was born at a 48 hour workshop at MozFest 2011 in London. It subsequently spilled over into an international, collaborative effort involving dozens of data journalism’s leading advocates and best practitioners — including from the Australian Broadcasting Corporation, the BBC, Deutsche Welle, the Guardian, the Financial Times, La Nación, the New York Times, ProPublica, the Washington Post, the Texas Tribune, Zeit Online and many others. Since its publication, the Data Journalism Handbook has been widely used and widely cited by students, practitioners and researchers alike, serving as both textbook and sourcebook for an emerging field. It has been translated into over 12 languages — including Arabic, Chinese, Czech, French, Georgian, Greek, Italian, Macedonian, Portuguese, Russian, Spanish and Ukrainian — and is used for teaching at many leading universities, as well as teaching and training centres around the world, as well as being a well-cited source for researchers studying the field. The handbook was an initiative of the European Journalism Centre and the Open Knowledge Foundation, with support from the Dutch Ministry of Education, Culture and Science. It is published by O'Reilly Media and freely available online under a Creative Commons Attribution-ShareAlike license. The Data Journalism Handbook 2 is planned and successfully funded with the help of Google News Initiative. Jonathan and Liliana start their editorial process and the selection of authors for Data Journalism Handbook 2. The Data Journalism Handbook 2 is published in print by Amsterdam University Press.